Le Mariee' : The Bridal Makeup Artist- Why you should hire one. The Bridal Makeup Artist- Why you should hire one. I found this newsletter off of the Easy Makeup Guide...makes sense to me! What do you think? You have all these dreams, visions and ideas about how you want your wedding day to be. It's a special time for you. You're SO enthusiatic and excited. You spend many hours, days and months planning the wedding you've always wanted. You've put so much work into this, you want everything to be perfect. You hire your photographer, you buy the perfect shoes and jewellery. You pick out your cake and flowers but most of all - you love your wedding dress. You feel like a million bucks wearing it. You're almost sad you can only wear it once. You feel like royalty wearing it - you're so proud and glowing with happiness. This is your day, your moment! You want to glow, to radiate, to beam with happiness. You want to remember every moment. You were able to capture these moments with all your photographs and videos. You will look through these pictures many times over. How will you feel if, everytime you lookin through your photos, you hate the way your makeup looks?? IS YOUR FOUNDATION THE WRONG COLOR? DOES YOUR FACE LOOK OILY? DOES YOUR FACE LOOK WASHED OUT? IS YOUR FACE LIGHTER THAN YOUR NECK? ARE YOUR DARK UNDER EYE CIRCLES DARKER OR ARE IS YOUR EYE AREA TOO LIGHT COMPARED TO THE REST OF YOUR FACE? ARE THE RED AREAS (BLOTCHES, PIMPLES, UNEVEN SKIN PIGMENTATION) ON YOUR FACE REALLY STANDING OUT? Photographs will accentuate all of these features and colors, just so you know. 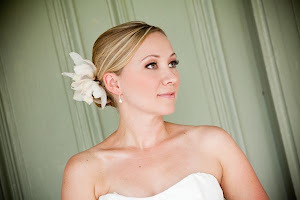 A makeup artist is trained to take all of these aspects into consideration when applying your wedding day makeup. Why take a chance on your wedding day makeup?? If you want to try and save money here, think again. Read these reasons why a professional can ensure your wedding day look doesn't FLOP! 3- Understand the look you're going for and will follow through with that request. Don't you want to take everybody's breath away, especially your husband-to-be? 4- Will allow you to be pampered during this special time. Why stress over makeup application on your wedding day? Do you REALLY need it?